Dr. Troy Quinn ’05 acknowledges applause after after a concert by the Owensboro Symphony Orchestra in Kentucky. Dr. Troy Quinn ’05, the maestro who conducts symphony orchestras, has shared a concert stage with Mick Jagger and plays Star Wars soundtracks while driving. Music in all its forms is Quinn’s passion. A voice major and theatre minor at Providence College, Quinn is music director and conductor of the Owensboro Symphony Orchestra in Kentucky and the Venice Symphony in Florida. He lives in Los Angeles, where he teaches conducting on the faculty of the Thornton School of Music at the University of Southern California. As a student at Notre Dame High School in West Haven, Conn., Quinn’s plan was to study communications and become a weather forecaster. Because his family vacationed in Rhode Island, he decided to tour Providence College. In his first year at Providence College, Dr. 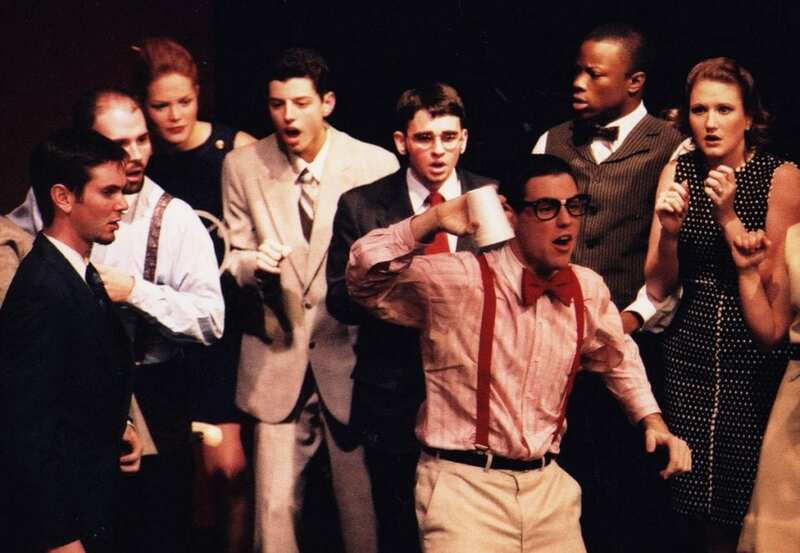 Troy Quinn ’05 sang in musical “How to Succeed in Business Without Really Trying.” He is fourth from left, in the tan suit. As a first-year student, Quinn sang in the musical How to Succeed in Business Without Really Trying. 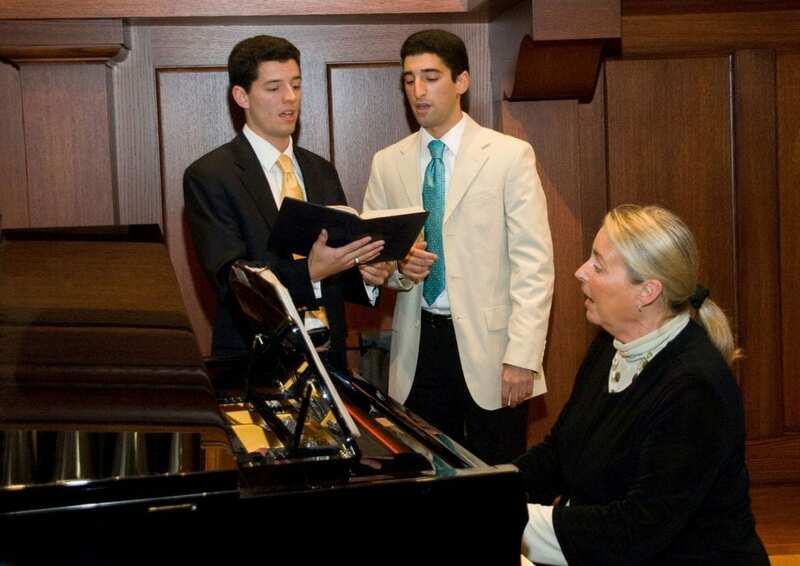 He caught the attention of Dr. Michele Holt, director of choral activities, and David Harper, associate professor of music, who encouraged him to audition for the College’s premier choir, I Cantori, and to take music classes. During a choir rehearsal in Guzman Hall chapel, which served as the music room before the Smith Center for the Arts was built, Dr. Holt asked Quinn to conduct the choir. “She recognized some raw innate talent in me and said, ‘Come up and conduct this piece,’” Quinn said. “It was ‘Prayer of the Children.’ I had no idea what I was doing, but she saw my musicality, and that I could be trained. That started the transition from singing to conducting. During his senior year, Quinn did an independent study, conducting the choir and orchestra in Handel’s Messiah for Christmas, but his focus remained singing. After graduation, he entered the Manhattan School of Music to study opera and vocal performance in a two-year master’s program. “It was world-class training with the best of the best, but I missed Providence, that community feeling,” Quinn said. When he finished the degree, he returned to PC for three years to work as a part-time instructor of voice and conductor of the women’s choir. While at PC, Quinn also taught at Portsmouth Abbey, a private high school for boarding and day students in Rhode Island. To gain experience as a conductor, he established the Portsmouth Institute Orchestra, made up of musicians from the Rhode Island Philharmonic and Boston Pops who were available to play in the summer. It was so successful that Quinn returned to Rhode Island to conduct even while studying for a doctorate in Los Angeles. Dr. 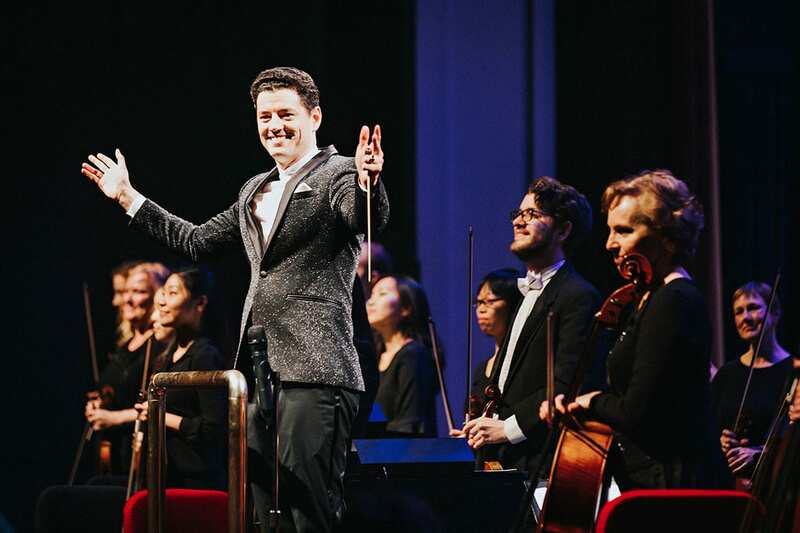 Troy Quinn ’05 became music director and conductor of the Venice Symphony in Florida in 2018. Quinn was awarded a full scholarship to study for a doctorate in conducting at USC. In Los Angeles, talented artists have the opportunity to sing and play in orchestras on film soundtracks, TV shows, and albums. As a doctoral student, Quinn took advantage of studio work. He sang background for movies and TV, including Glee and two Barry Manilow specials, and on Josh Groban’s Stages album. In 2013, when the Rolling Stones brought their 50 & Counting Tour to the West Coast, Quinn performed with them as a backup singer. When the Stones needed someone to conduct the choir in “You Can’t Always Get What You Want” onstage at a concert in Buffalo, N.Y., Quinn happily filled in. 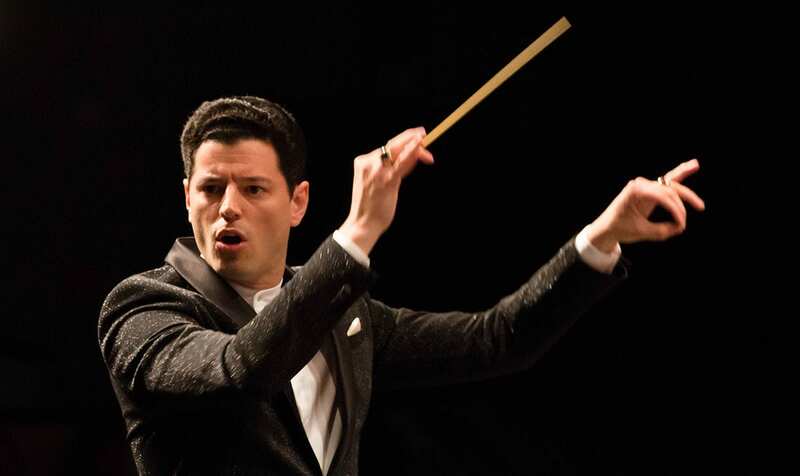 Quinn accepted a three-year contract in 2015 to be music director and conductor of the Juneau Symphony in Alaska, which performs from October to May. He was able to work from Los Angeles, traveling to Juneau for rehearsals and concerts. In 2017, Quinn became music director of the Owensboro Symphony Orchestra in Kentucky. When his contract ended in Juneau in 2018, he added the Venice Symphony in Florida. At a dinner to mark the 80th anniversary of Friars Club in 2008, Dr. Troy Quinn ’05, left, sang with his brother, Shane Quinn ’07, as Sherry Humes Dane, director of liturgical music, accompanied them on piano. To conduct, you learn by doing, Quinn said. As music director, Quinn hires musicians and plans concerts. He considers music selection to be key, to sell tickets and to please audiences and musicians. There are three parts to music selection: Will the audience like it? Will the musicians like it and feel challenged by it? And can Quinn live with it for months? “My barometer is: Would I have liked this before I knew anything about how great Mozart is? Is this going to appeal to your average American citizen? Is the music good?” Quinn said. Tastes vary geographically, Quinn said. Conducting is art, according to Dr. 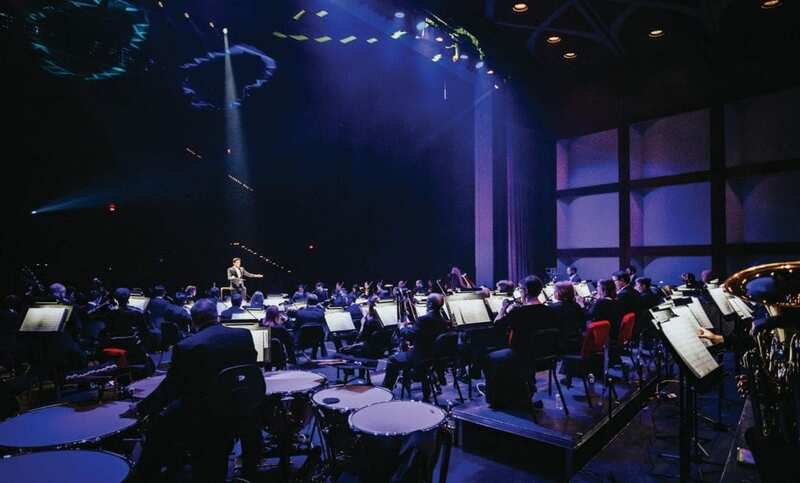 Troy Quinn ’05, shown conducting the Owensboro Symphony Orchestra in Kentucky. He also teaches conducting at the University of Southern California. At USC, Quinn teaches the art of conducting. Quinn sees his role as that of a diplomatic middleman. Quinn’s brother, Shane Quinn ’07, who majored in theatre at PC, now works in arts administration at Yale School of Drama. Quinn and his fiancé, Sheeba Alam, a sales manager and mezzo-soprano from Chicago, will marry in May.